Zackary Bowman is an American football cornerback for the Chicago Bears of the National Football League. Became a dependable starter in his second season with Chicago and has 7 INTs in 17 career games (12 starts)... Tallied 76 tackles (57 solo), 6 PBUs and 1 FF... Added 6 career special teams stops and has recovered a fumble in the end zone on special teams... Saw his rookie season come to an end early when he was injured in his first NFL game vs. MIN (10/19). 2009 : Led the Bears with career-high 6 INTs, which ranked 4th in the NFC... Collected 75 tackles (56 solo), 1 forced fumble, 5 special teams tackles and ranked 2nd on the team with 6 PBUs... Made his first career start vs. PIT (9/20). 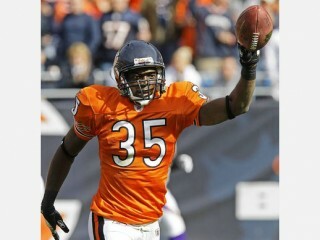 2008 - Had his season cut short by injury, appearing in just 1 game for the Bears... Managed to record his first career INT and recover a fumble in the end zone on special teams for a TD in his only game vs. MIN (10/19)... Credited with 1 tackle and 1 special teams stop as well... Placed on Injured Reserve (10/22). Attended the University of Nebraska (2005-2007) after spending two seasons at New Mexico Military Institute... Saw action in 22 games, including 9 starts as a Cornhusker... Compiled 56 tackles (46 solo), 17 PBUs, 3 INTs and 2 TFLs in Lincoln... Suffered torn ACL during fall practice of his senior season and redshirted... Earned junior college All-America honors and was the No. 2 junior college recruit in the nation in 2004 according to Rivals.com... Notched 10 INTs - including 2 for TDs - and 22 PBUs at New Mexico Military Institute. Three-time all-state first team-selection at Bartlett H.S. in Anchorage, Alaska... Took home Player of the Year honors as a senior... Also starred on the basketball team where he was teammates with 2008 Final Four hero Mario Chalmers... Son of Zackary and Zelma Bowman... Majored in sociology... Married to wife, Alicia.